Shrimp paste (aka shrimp sauce) is a paste made with fermented shrimp and salt. It is used a lot in Asian cooking to flavour curries, broths, braised dishes, steamed dishes and fried rice and is very high in umami-ness. Shrimp paste is used in many different ways in Asian cooking and is an ingredient that doesn’t have a distinct flavour that can be instantly identified unless you are using it on it’s own. When used in broths and thai curries, it provides a huge boost in umami and saltiness and it gives a more full bodied flavour. It is also used in steaming meats, vegetables and sometimes added to vegetables and when used that way has a very strong pungent (stinky 😛 ) smell that definitely is something that you need to get used to else it can be very off putting. It is also very commonly used in fried rice in south Asian cuisines and gives the rice a boost in saltiness and umami flavour. 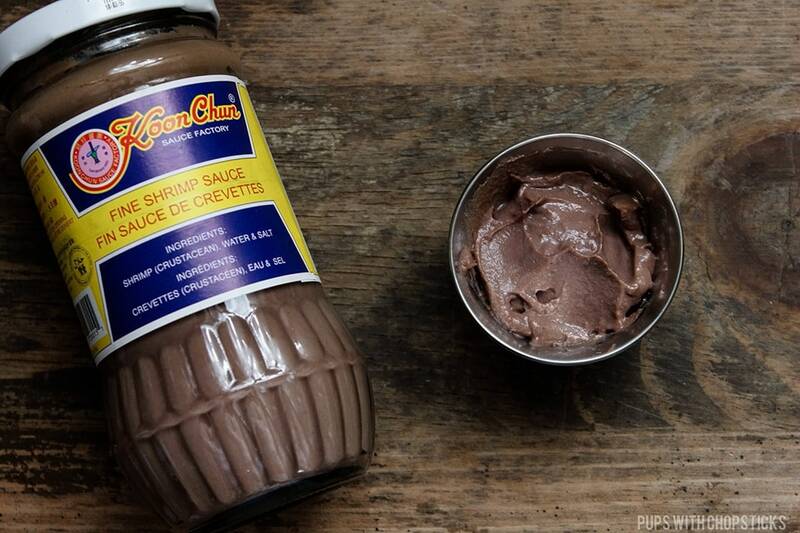 If you cannot find shrimp paste, you can substitute it with half the amount of fish sauce. You can find shrimp paste at an Asian grocery store – they are usually stored in the aisles where all the jars of sauces are. When you are looking for it, keep in mind that shrimp paste and shrimp sauce are the same thing and are used interchangeably. Look for a glass or plastic jar filled with a grayish brown thick paste. If possible, try to find one that only has 2 ingredients – shrimp and salt. If this is difficult to find, you can also find this online as well. Shrimp paste has a very strong smell, and if you aren’t used to it you might find the smell offensive and gross – but if you can get over the smell it’s actually a very tasty ingredient to work with and can add a boost of umami and complex flavours to dishes you use it on. This is a VERY salty ingredient and a little bit goes a very long way. The funny thing is, although it is called shrimp paste, it doesn’t really taste like shrimp at all but it does have a slightly fishy flavour. The texture of this paste is usually thick and needs to be cut with liquid. The thickness of this paste varies as well. Some of the thai versions are super dry and thick (like peanut butter) whereas the ones labeled ‘Shrimp Sauce’ are usually slightly on the thinner side with the consistency similar to a mayonnaise. Once opened, store this in the fridge.